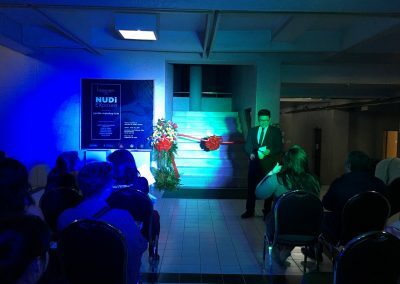 Prof. Yvette Malahay-Kim’s solo art exhibit entitled “NUDI Exposed” reflects the artist’s fascination with the colors and diversity of the Philippine underwater ecology and her advocacy to conserve and protect the marine resources of the Philippines. 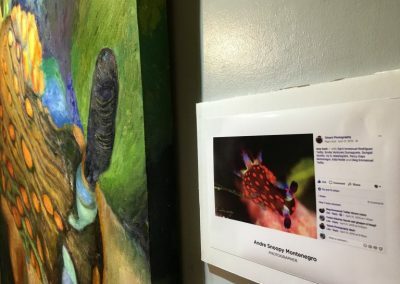 In retrospect, Prof. Yvette Malahay Kim’s colorful art exhibit which lasted from January 18 up to February 12, 2018 was a tribute to the colors and shapes of the small underwater creatures known as the nudibranch, or sea slugs, with its different types or species. In Prof. Yvette’s own words: “What drew me to this creature was the colors and the shapes it possessed. In my studies of color, I can see clearly the various color theories applied”. 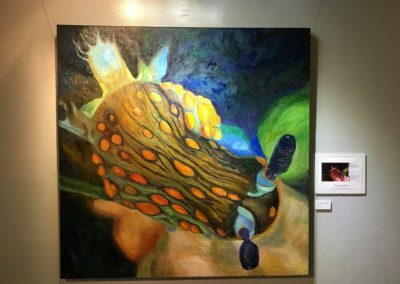 Prof. Malahay-Kim has expressed “meaning and purpose” in her art works in magnifying the wonderful and fascinating small sea creatures known as the nudibranch, by painting them realistically in large canvasses, in effect magnifying her diver friends’ underwater photos of these colorful, multi-shaped creatures. Even small creatures under the sea are wonderful and fascinating to behold in their colorful patterns and shapes – truly a play in colors and an expression of wonder, delight, and awe at, if I may say it, God’s handiwork, God’s artistic creation. 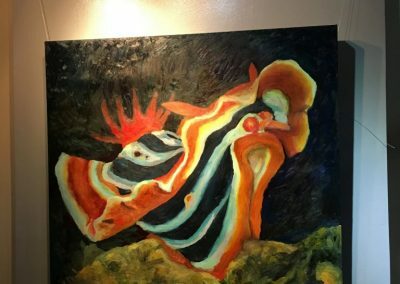 It was an art exhibit that educated and informed the audience on the existence of the tiny, colorful creatures under the Philippine seas known as the nudibranchs, which exist along with the magnificent corals, sea fishes, and other sea creatures. It was a vivid way of advocating to conserve our marine resources and to protect our seas from climate change and overfishing, from plastic pollution and waste disposals in our seas. Photos from the opening of the art exhibit and the paintings of the different species of nudibranch themselves are shown below.